Total price – Single N$ 5750 – Sharing (2 people) N$ 9900. This includes all meals, entry fees into the National Parks, and full board at the hotels. 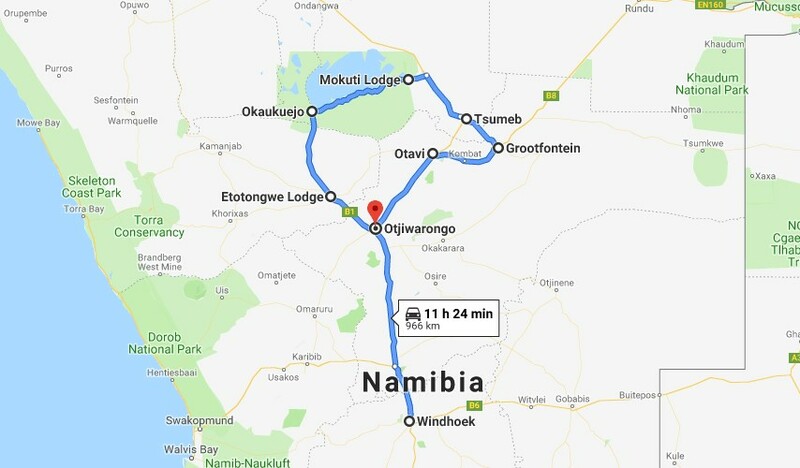 At the Windhoek Country Club Hotel the northern route will commence and take us towards Okahandja where the NamWater water treatment facility for Windhoek and other central areas is situated and where we will make a brief stop-over. Then we will continue further north where at the small town of Otavi we enter the Grootfontein-Otavi-Tsumeb Karst area. We will look at the water scheme associated with water supply for the Central areas of Namibia, visiting the canal that forms part of the eastern National Water Carrier. We will also look at various other interesting Karst aspects on our way to the Tschudi mine. There we will be given a detailed information about tackling the water issues related to mining within the Karstic environment. Then we will stop-over for the night at Mokuti Lodge that borders the Etosha National Game Park. Early during Friday morning we will commence with a trip through the Etosha Park on a game viewing trip and also visiting some fountains on the edge of the Etosha Pan. We will then make our way out of the Park towards the small town of Outjo where we will overnight. Early the next morning we will return to Windhoek, where we should be back by lunch time on Saturday the 27 July.